Ragwort (Senecio cineraria): growing, planting, caring. Jacobaea maritima - silver ragwort, formerly known as Senecio cineraria - is a perennial plant species in the genus Jacobaea in the family Asteraceae, native to the Mediterranean region. 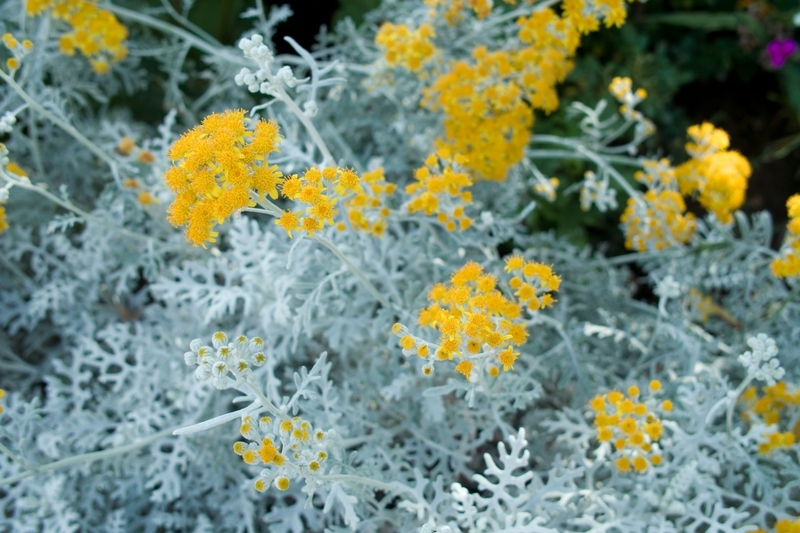 It was formerly placed in the genus Senecio, and is still widely referred to as Senecio cineraria. The silver ragwort is a white-wooly, heat and drought tolerant evergreen subshrub growing to 0.5–1 m (1.6–3.3 ft) tall. The stems are stiff and woody at the base, densely branched, and covered in long, matted grey-white to white hairs. The leaves are pinnate or pinnatifid, 5–15 centimetres (2.0–5.9 in) long and 3–7 centimetres (1.2–2.8 in) broad, stiff, with oblong and obtuse segments, and like the stems, covered with long, thinly to thickly matted with grey-white to white hairs - the lower leaves are petiolate and more deeply lobed, the upper leaves sessile and less lobed. 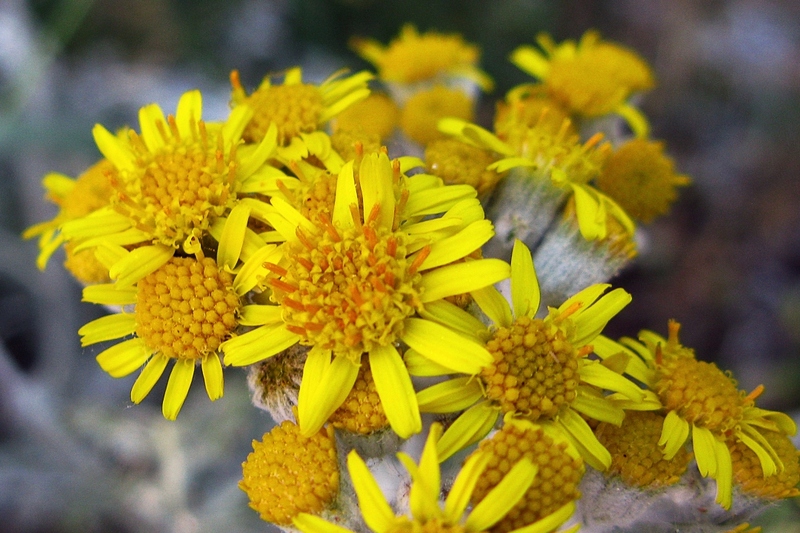 Ragwort won't stand frosts lower to -10°C - in cold regions grow it as an annual, or protect it in the winter. 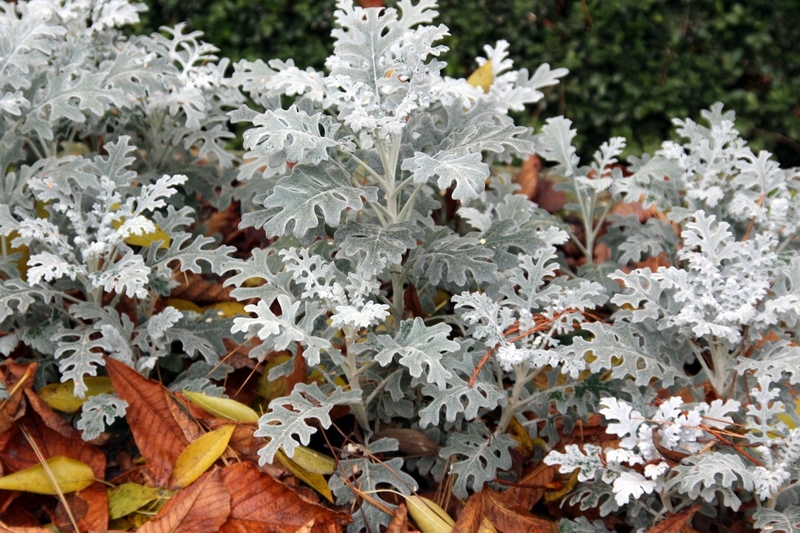 Inside : Between February and March, sow the dusty miller at 19 to 24 ° C. Use a fine compost mixed with sand. Cover the seeds by one to two times their height. 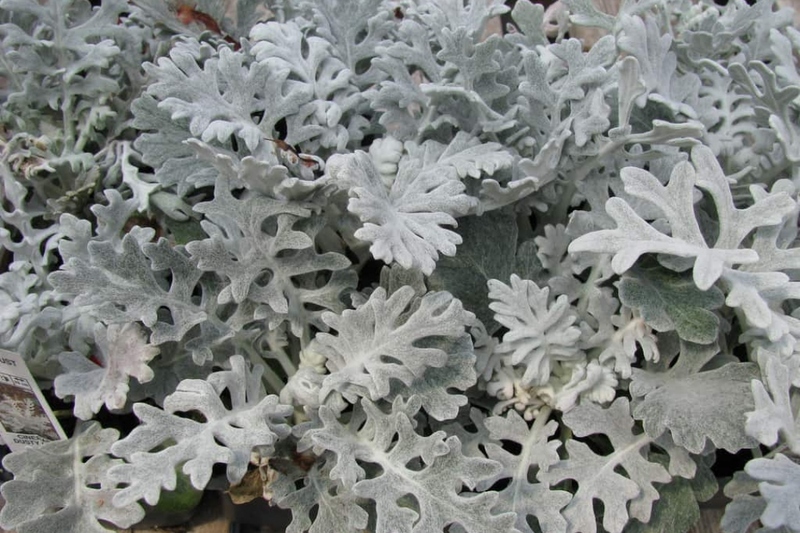 If you sow later than March, we advise you to wait until the next year to plant your dusty miller outdoors. Outside : This sowing method should be reserved for very sunny regions. Sow at 19 to 24 ° C. For example, use a fine compost mixed with sand to obtain a well-drained mix. Cover the seeds by one to two times their height, then water in rain. Replant the silver ragwort in May-June, in the ground. Choose a well-drained soil, moderately rich, in full sun. Silver ragwort are drought resistant. In the open soil, dig a hole 3 times the size of the root ball. Mix several handfuls of coarse sand or gravel for better drainage. Soak the root ball in a bowl for 3 minutes. Install the plant and refill. To get an elegant mass effect, install at least 3 plants spaced 30 cm apart. Water copiously right after planting. Thin out the plants when they have some true leaves, and keep only one every 5 cm. Water especially the first weeks. Cineraria is a Mediterranean plant, so it will suffer more from excess than from lack of water. In contrast, the first weeks after sowing, water as soon as the top dries. Plant silver ragwort in May-June, in the ground or in pots. Choose a well-drained soil, moderately rich, in full sun. Silver ragwort are drought resistant. In the open soil, dig a hole 3 times the size of the root ball. Mix several handfuls of coarse sand or gravel for better drainage. Soak the root ball in a bowl for 3 minutes. Install the plant and refill. To get an elegant mass effect, install at least 3 plants spaced 30 cm apart. In pots, prefer a sunny spot, and a substrate of garden soil and sand. Drain with clay balls or gravel. Water copiously right after planting. If your silver ragwort are planted in pots and winter temperatures are low, put them in a shelter during the winter. Starting April you can take out your sheltered silver ragwort. The silver ragwort is a sub-shrub, so it gradually makes wood on the old stems. Unfortunately, this gives it a sickly look, so prune it in March each year. Shorten all the stems, keeping nice leaves under the point of cut. If your silver ragwort shows signs of gray felting on the leaves, and wilting, suspect gray mold. It is the symptom that the plant is in too much wet soil. Provide a better drained soil by replanting it elsewhere.